In 2008 the National Indigenous Eye Health Survey showed that Aboriginal and Torres Strait Islander people aged 40 and above have six times as much blindness than non-Indigenous people. 94% of that vision loss and blindness was unnecessary and could be prevented or treated. Following extensive consultation with community and providers, the sector-endorsed Roadmap to Close the Gap for Vision was launched in 2012. It includes 42 recommendations for appropriate and accessible eye care services. In the last five years some good progress has been made and 16 of these recommendations have been fully implemented. Further, in 2016 the National Eye Health Survey reported the gap between Indigenous and non-indigenous rates of blindness had been halved and was now 'only' three times. Although this is still not acceptable and there is more work to be done, clearly eye health is one area where the gap can be closed. Improving the coordinated provision of eye care serves demonstrates how to effectively link primary care with specialist services. The lessons learnt provide a template for the provision of other specialist services such as for ears or hearts or lungs or kidneys. The Jean McCaughey Oration was established to honour the late Drs Jean and Davis McCaughey in recognition of their collective contributions to advocating for social justice and human rights. They made outstanding contributions to the development and communication of ideas and evidence contributing to the health, wellbeing, social justice and human rights of a diverse range of Victorian, Australian and international communities. Melbourne Laureate Professor Hugh Taylor is the Harold Mitchell Professor of Indigenous Eye Health at the University of Melbourne. 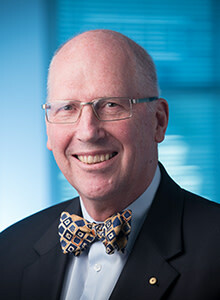 He was Head of the Department of Ophthalmology at the University of Melbourne and the Founding Director of the Centre for Eye Research Australia from 1990 to 2007. Prior to that, he was a Professor of Ophthalmology at the Wilmer Institute at the Johns Hopkins University in Baltimore with joint appointments in the Departments of Epidemiology and International Health. Professor Taylor’s current work focuses on Aboriginal eye health. He has led the efforts to eliminate trachoma in Australia and developed “The Roadmap to Close the Gap for Vision”, a blueprint to provide sustainable eyecare services to Indigenous Australians. He has worked with WHO in different roles for over 30 years. He has written 36 books and reports and more than 700 scientific papers. He has received multiple international awards and prizes and is a Fellow of the Australian Academy of Health and Medical Sciences. In 2001, he was made a Companion in the Order of Australia. Professor Taylor is the President of the International Council of Ophthalmology and was Deputy Chairman of Vision 2020 Australia and Vice President of the International Agency for the Prevention of Blindness. He is also a Member of the Expert Advisory Panel of The Queen Elizabeth Diamond Jubilee Trust.